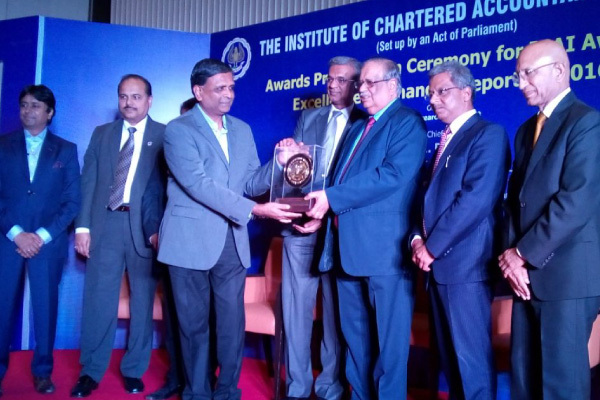 On January 25, 2018, The Akshaya Patra Foundation was honoured with the ICAI Gold Shield Award for Excellence in Financial Reporting for the year 2016–2017 under the Category XII – Not-for-Profit Sector. The award was presented by Shri M Damodaran, former Chairman, Securities and Exchange Board of India (SEBI) in Mumbai to the CFO of Akshaya Patra, Mr R Ganesh. The award was given based on the accounting practices adopted by the Foundation, the policies adopted for disclosure, and presentation of financial statements, among other information contained in the annual report and also the basis of degree of compliance with Accounting Standards, statutory guidelines, regulations, etc.